FILE - Cameroonians, including women and children, refugees from the Cameroon's restive anglophone regions, gather for a meeting at Bashu-Okpambe village, in Boki district of Cross Rivers State in Nigeria, Jan. 31, 2018. As a campfire burns in a remote village on Cameroon's northwestern border with Nigeria, seven men and five boys roast cocoa yam for supper. The eldest among them, 45-year-old Bruno Nfor, says the group has spent at least a week in the bush after violence broke out in the town of Tadu. Armed separatists attacked the town, he says. Then, soldiers began burning houses and arresting people indiscriminately. Many people were tortured or wounded. Nfor says if he and his friends had the means, they would leave the bush where they are hiding and cross over to Nigeria, because they are not safe in the English-speaking northwest and southwest regions of Cameroon, where they they say they were treated like animals and terrorists before they fled. In January, Nigerian authorities said they had arrested at least two dozen Cameroonians receiving military training on its territory. Nfor says since then, Cameroon's military has been sweeping through border villages, searching for armed separatists whom they suspect of either going to or returning from Nigeria. This month, the U.N. refugee agency reported that since mid-2017, tens of thousands of people had fled Cameroon’s two Anglophone regions, where the separatist movements are active. English-speakers there say they are discriminated against by the country's French-speaking majority. Paul Atanga Nji, Cameroon's minister of territorial administration, says thousands are hiding in bushes and mountains around the border with Nigeria. Last week, he visited the two English-speaking regions to plead for the displaced populations to return. He says many of those escaping have weapons. "They have to come out of the bushes, go back to their villages and put down the guns. If they do that, it is fine for them. We have recovered a lot of guns, a lot of weapons, a lot of explosives brought by people who are in the bushes, so we are asking them to repent and go out of those atrocities because you cannot succeed. We have a strong nation, we have solid institutions and there is no hiding place for truants in Cameroon. You cannot hide," Nji said. FILE - A Cameroonian refugee sit holding her child in front of a make-shift home, where hundreds are being sheltered, at Bashu-Okpambe village in Boki district of Cross Rivers State in southeast Nigeria, Jan 31, 2018. 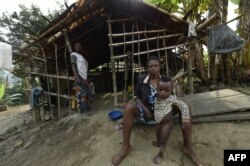 But many of those who fled, like 30-year-old Leslie Ngala, say they are scared of the Cameroonian military. Ngala says he is escaping Cameroon's military, especially the gendarmes. He says before he fled, even little children would try to escape whenever they saw a military person because they either had seen or heard how the soldiers mistreated people. He says his motorcycle was seized by people he recognized as being from the Cameroonian military, not separatist fighters. The military has denied the allegations, saying the separatists are causing the violence. Didier Bajeck, a spokesperson for Cameroon's military, said soldiers have remained professional as they carry out their duties to protect people and property. Nformi Balla, an elder from northwestern Cameroon, says Nji is turning on traditional rulers because the population still listens to them after losing confidence in the administration and the military. "We have seen the bloodshed and we ourselves are tired of this war. We too cry for peace and we assured the minister that we shall do everything within our means and powers to facilitate the peaceful return of our people," Balla said. In October, the separatists declared what they call the Republic of Ambazonia and asked the military to surrender and join them or leave their territory. So far, hundreds of people and about 30 police officers and soldiers have been killed.